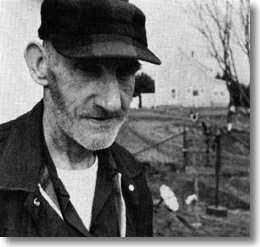 Ellison was born in North River, Lunenburg County, where he lived for his entire life, leaving only for temporary periods to work in wood camps as a saw filer, cook and blacksmith. After he stopped working, he lived in a small house in North River. 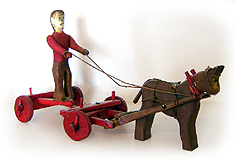 Ellison made several objects for his yard, including two sculptures with figures attached to automobile steering wheels. One of these is in the permanent collection of the Canadian Museum of History and the other is in the permanent collection of the Art Gallery of Nova Scotia. He also carved small men from stumps. 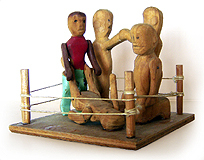 He was discovered by Chris Huntington around 1974 and his work was included in the first touring exhibit of contemporary Nova Scotian folk art organized by the Art Gallery of Nova Scotia. That exhibit toured Canada from January, 1977 to May, 1978. Unfortunately, Ellison died in August of 1976, a few months before the exhibit opened. He was not very prolific, and his work is rarely seen outside of permanent museum collections. Ref: Art Gallery of Nova Scotia, Folk Art of Nova Scotia (1976); Kobayashi/Bird, A Compendium of Canadian Folk Artists (1985); Art Gallery of Nova Scotia, A Life of Its Own – Chris Huntington and the Resurgence of Nova Scotia Folk Art 1975 – 1995 (1997); Philip Tilney, Bill Richardson, This Other Eden: Canadian Folk Art Outdoors (1999); Blake McKendry, An Illustrated Companion to Canadian Folk Art (1999).